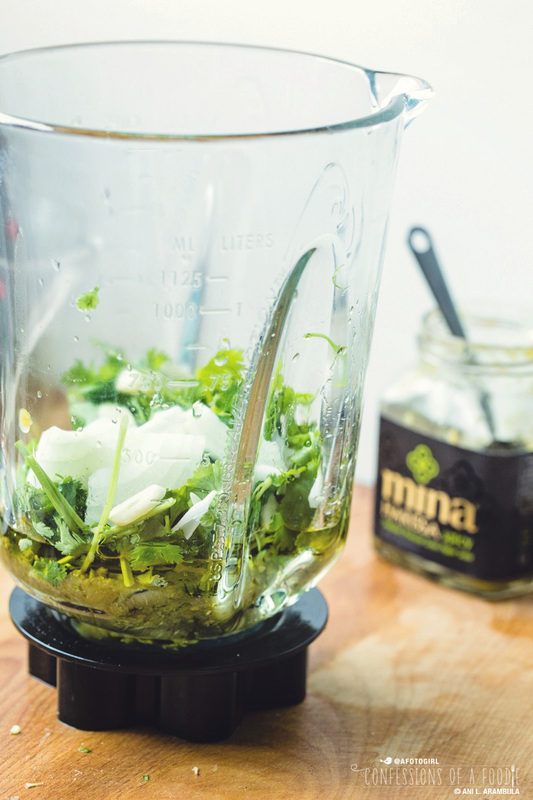 Spice up your carne asada with some Mina Harissa Spicy Moroccan Green Pepper Sauce. Add some avocado crema and you've got a winning combo perfect for summer entertaining. Welcome July with this twist on a Mexican classic: Carne Asada Tacos with Harissa Avocado Crema and Mexican Pickled Red Onions. Grilling season is in full swing which makes me happy. Not to say that grilling season really ever ends in sunny San Diego but at least now, the rest of the nation has caught up! So I thought I’d share this little twist on one of my favorite summer grill-worthy foods: the carne asada taco. There is no meal that reminds me more of those long ago carefree summers as a kid than the smell of steaks grilling. My dad’s carne asada kept all his girls happy for summertime eats. It’s one of my favorite dishes to grill myself and I’m thrilled to be sharing my latest interpretation with you. I’ve taken yummy flap meat, marinated it in a blend of cilantro, onions, garlic and Mina Harissa Spicy Moroccan Green Pepper Sauce overnight. 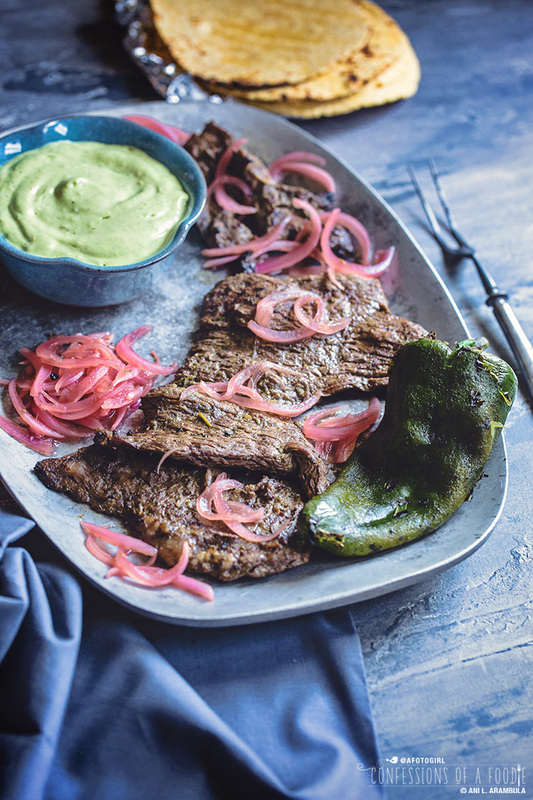 Then after it’s kissed the grill, I've sliced it, added it to a warmed, slightly charred-around-the-edges corn tortilla, added some Mexican pickled red onions and strips of fire roasted poblano chile and topped it with a harissa spiked avocado crema. Finished with a squeeze of lime, a sprinkling of cotija cheese and a few cilantro leaves and you’ve got yourself one loaded bite of taco bliss. Another thing that I love about carne asada is that it’s like, instant party food. Seriously. One pound of steak can feed 4-6 people. Just grill it up, chop it up into bite-sized pieces, place it on table with warmed tortillas and bowls of toppings like chopped onions, tomatoes, avocado, cilantro, sliced jalapeños, queso fresco or cotija, some pico de gallo, taqueria-style salsa, or the green or red Mina Harissa and then let your guests make their own custom tacos. Easy-peasy instant party! Just don’t forget the cervezas and maggies. For best results, make the marinade the night before and allow the steak to bask in it’s yumminess overnight. Ditto the pickled onions. If you’re short on time, at least marinate the steak 1 - 2 hours before grilling. I prefer flap meat or skirt steak for carne asada but any thin cut of steak will do. If you’re using skirt steak, make sure your grill is HOT and with both steaks, try not to overcook and flip only once. 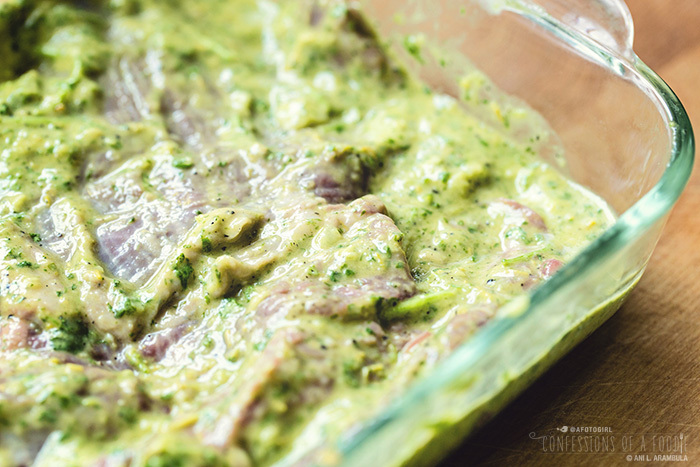 The marinade can easily be used for up to 2 pounds of meat without needing to scale the recipe. If you can’t find Mexican crema in your local supermarket, substitute sour cream. Use just over half as much as indicated, add the juice from a quarter of a lime, then add water to thin it to make up the rest of the recommended volume. Stir well before adding to the blender. The pickled onions will keep in the refrigerator for 2-3 weeks. 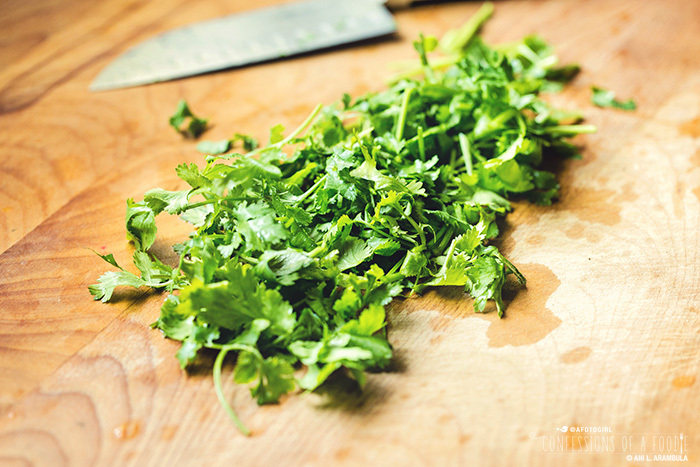 Make the marinade: Place all the marinade ingredients into a blender and pulse until blended well and cilantro is mostly chopped fine. Place the steak into a shallow dish or resealable plastic bag. Pour the marinade over the steak and massage it in. 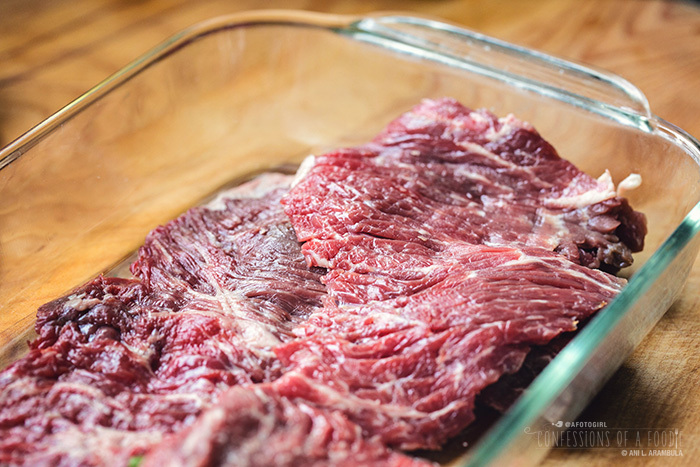 Cover the dish with cling film and place in the refrigerator overnight to marinate. Remove steaks from refrigerator and allow to come to room temp, about 20-30 minutes. Prepare grill. In the meantime, make the crema: To a blender, add the avocado, crema, harissa, lime juice and a pinch each of salt and ground black pepper. Puree on high until smooth. Taste and adjust seasoning adding more salt and pepper or more harissa for a hotter condiment. Feel free to add water by the teaspoonful for a thinner consistency. Store in refrigerator, covered, until ready to serve. Lightly massage olive oil onto poblano; set aside. When grill is hot (at least 450 degrees if using a gas grill, like me), place the poblano on the grill and char on all sides. While it’s charring, shake off excess marinade from the steak and add to grill. Cook the steak for 2-3 minutes then flip and cook an additional 1-2 minutes or to taste (careful not to overcook, these steaks taste best medium rare). 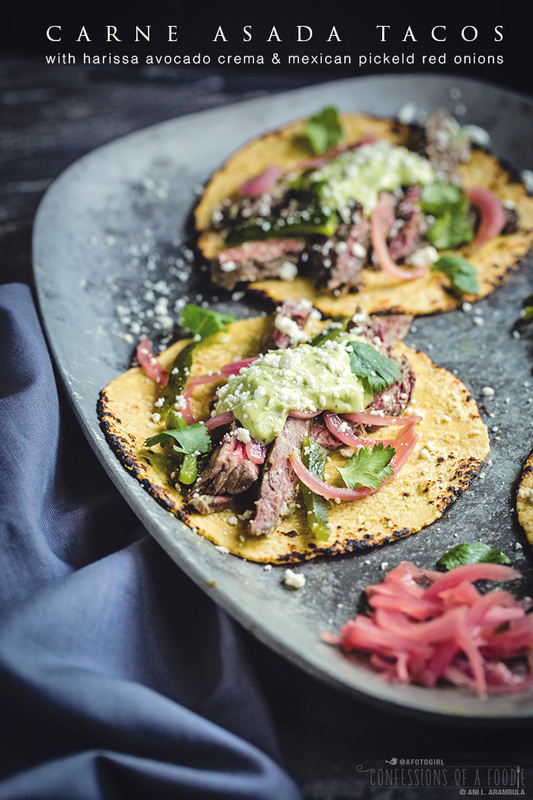 Remove steak to a platter and tent with foil, allowing the steak to rest 3-4 minutes before slicing against the grain, then cutting into bite-sized pieces (I left the steak as strips for the photos but the tacos are actually easier to eat when steak is cut into smaller pieces). When poblano is charred all over, remove to a bowl and cover bowl with cling film. Allow the chile to steam for 5 minutes. After 5 minutes or when chile is cool enough to handle, rub the skin off, using a paper towel if necessary (do not rinse chile!). Cut top off of chile, then slice chile in half and remove the seeds and membranes. Slice the poblano into thin strips from the short side and set aside. Scatter the tortillas on the hot grill to warm, flipping a few times until lightly charred, pliable and warmed through. Alternately, stack the tortillas into piles of 6 and warm directly on the grates of a gas stove, flipping often, until warmed through (use tongs if you must. In my family doing that would earn you some teasing!). Remove to a towel-lined bowl and cover to keep warm. 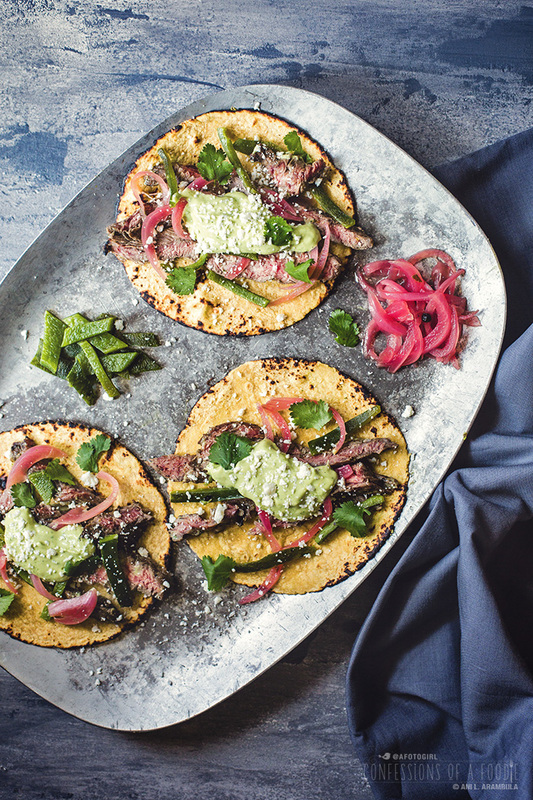 To assemble the tacos, place a tablespoon or two of chopped meat in the center of a warmed corn tortilla, add a few strips of poblano, some pickled onions and a healthy dollop of the harissa avocado crema, to taste. Top with a sprinkling of cotija and chopped cilantro. Squeeze some lime juice over the taco and serve. Disclosure: Cassablanca Foods, the maker of Mina Harissa, is providing some compensation for recipe development. This is the fourth of eight recipes that I'll be sharing through the end of summer. 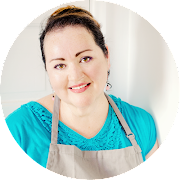 To help offset the cost of running this blog I sometimes take on sponsored posts but rest assured, I only work with brands I love and use myself and feel 100% confident in the sharing of these brands with you. As always, all opinions, photographs and recipes are my own. I love carne asada and am so thankful that I live in California where it is available everywhere! But being able to make it at home is just - wow. Thanks for such a yummy recipe!